Chaos theory is a branch of mathematics focusing on the behavior of dynamical systems that are highly sensitive to initial conditions. "Chaos" is an interdisciplinary theory stating that within the apparent randomness of chaotic complex systems, there are underlying patterns, constant feedback loops, repetition, self-similarity, fractals, self-organization, and reliance on programming at the initial point known as sensitive dependence on initial conditions. The butterfly effect describes how a small change in one state of a deterministic nonlinear system can result in large differences in a later state, e.g. a butterfly flapping its wings in Brazil can cause a hurricane in Texas. Chaos theory concerns deterministic systems whose behavior can in principle be predicted. Chaotic systems are predictable for a while and then 'appear' to become random. The amount of time that the behavior of a chaotic system can be effectively predicted depends on three things: How much uncertainty can be tolerated in the forecast, how accurately its current state can be measured, and a time scale depending on the dynamics of the system, called the Lyapunov time. Some examples of Lyapunov times are: chaotic electrical circuits, about 1 millisecond; weather systems, a few days (unproven); the inner solar system, 4 to 5 million years. In chaotic systems, the uncertainty in a forecast increases exponentially with elapsed time. Hence, mathematically, doubling the forecast time more than squares the proportional uncertainty in the forecast. This means, in practice, a meaningful prediction cannot be made over an interval of more than two or three times the Lyapunov time. When meaningful predictions cannot be made, the system appears random. The map defined by x → 4 x (1 – x) and y → (x + y) mod 1 displays sensitivity to initial x positions. Here, two series of x and y values diverge markedly over time from a tiny initial difference. it must have dense periodic orbits. In continuous time dynamical systems, chaos is the phenomenon of the spontaneous breakdown of topological supersymmetry, which is an intrinsic property of evolution operators of all stochastic and deterministic (partial) differential equations. This picture of dynamical chaos works not only for deterministic models but also for models with external noise, which is an important generalization from the physical point of view, because in reality, all dynamical systems experience influence from their stochastic environments. 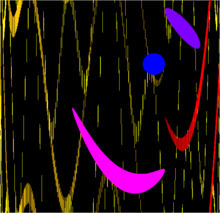 Within this picture, the long-range dynamical behavior associated with chaotic dynamics, e.g., the butterfly effect, is a consequence of the Goldstone's theorem in the application to the spontaneous topological supersymmetry breaking. were 45.92, 16 and 4 respectively. As can be seen, even the slightest difference in initial values causes significant changes after about 12 seconds of evolution in the three cases. This is an example of sensitive dependence on initial conditions. (or approximately 0.3454915 → 0.9045085 → 0.3454915) is an (unstable) orbit of period 2, and similar orbits exist for periods 4, 8, 16, etc. (indeed, for all the periods specified by Sharkovskii's theorem). An easy way to visualize a chaotic attractor is to start with a point in the basin of attraction of the attractor, and then simply plot its subsequent orbit. 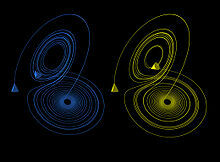 Because of the topological transitivity condition, this is likely to produce a picture of the entire final attractor, and indeed both orbits shown in the figure on the right give a picture of the general shape of the Lorenz attractor. 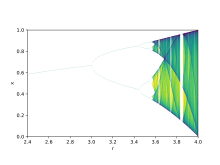 This attractor results from a simple three-dimensional model of the Lorenz weather system. 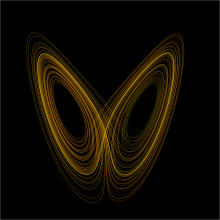 The Lorenz attractor is perhaps one of the best-known chaotic system diagrams, probably because it is not only one of the first, but it is also one of the most complex, and as such gives rise to a very interesting pattern that, with a little imagination, looks like the wings of a butterfly. changes dynamics from regular to chaotic one  with qualitatively the same bifurcation diagram as those for logistic map. In contrast, for continuous dynamical systems, the Poincaré–Bendixson theorem shows that a strange attractor can only arise in three or more dimensions. Finite-dimensional linear systems are never chaotic; for a dynamical system to display chaotic behavior, it must be either nonlinear or infinite-dimensional. are the system parameters. Five of the terms on the right hand side are linear, while two are quadratic; a total of seven terms. Another well-known chaotic attractor is generated by the Rössler equations, which have only one nonlinear term out of seven. Sprott found a three-dimensional system with just five terms, that had only one nonlinear term, which exhibits chaos for certain parameter values. Zhang and Heidel showed that, at least for dissipative and conservative quadratic systems, three-dimensional quadratic systems with only three or four terms on the right-hand side cannot exhibit chaotic behavior. The reason is, simply put, that solutions to such systems are asymptotic to a two-dimensional surface and therefore solutions are well behaved.
. 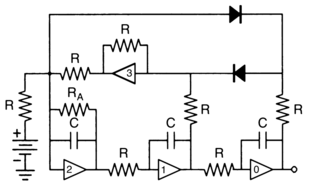 The output of op amp 0 will correspond to the x variable, the output of 1 corresponds to the first derivative of x and the output of 2 corresponds to the second derivative. 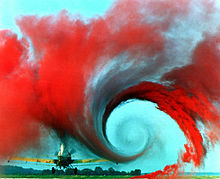 Although chaos theory was born from observing weather patterns, it has become applicable to a variety of other situations. Some areas benefiting from chaos theory today are geology, mathematics, microbiology, biology, computer science, economics, engineering, finance, algorithmic trading, meteorology, philosophy, anthropology, physics, politics, population dynamics, psychology, and robotics. A few categories are listed below with examples, but this is by no means a comprehensive list as new applications are appearing. ^ Boeing (2015). "Chaos Theory and the Logistic Map". Journal of the Optical Society of America B Optical Physics. 3 (5): 741. Retrieved 2015-07-16. ^ Kellert, Stephen H. (1993). In the Wake of Chaos: Unpredictable Order in Dynamical Systems. University of Chicago Press. p. 32. ISBN 978-0-226-42976-2. ^ a b Boeing, G. (2016). "Visual Analysis of Nonlinear Dynamical Systems: Chaos, Fractals, Self-Similarity and the Limits of Prediction". Systems. 4 (4): 37. arXiv:1608.04416. doi:10.3390/systems4040037. Retrieved 2016-12-02. ^ a b Werndl, Charlotte (2009). "What are the New Implications of Chaos for Unpredictability?". The British Journal for the Philosophy of Science. 60 (1): 195–220. arXiv:1310.1576. doi:10.1093/bjps/axn053. ^ Danforth, Christopher M. (April 2013). "Chaos in an Atmosphere Hanging on a Wall". Mathematics of Planet Earth 2013. Retrieved 12 June 2018. ^ a b Lorenz, Edward N. (1963). "Deterministic non-periodic flow". Journal of the Atmospheric Sciences. 20 (2): 130–141. Bibcode:1963JAtS...20..130L. doi:10.1175/1520-0469(1963)020<0130:DNF>2.0.CO;2. ^ Ivancevic, Vladimir G.; Tijana T. Ivancevic (2008). Complex nonlinearity: chaos, phase transitions, topology change, and path integrals. Springer. ISBN 978-3-540-79356-4. ^ a b Safonov, Leonid A.; Tomer, Elad; Strygin, Vadim V.; Ashkenazy, Yosef; Havlin, Shlomo (2002). "Multifractal chaotic attractors in a system of delay-differential equations modeling road traffic". Chaos: An Interdisciplinary Journal of Nonlinear Science. 12 (4): 1006–1014. Bibcode:2002Chaos..12.1006S. doi:10.1063/1.1507903. ISSN 1054-1500. PMID 12779624. ^ a b Trnka R., Lorencova R. (2016). Quantum anthropology: Man, cultures, and groups in a quantum perspective. Prague: Charles University Karolinum Press. doi:10.13140/RG.2.2.20009.80485. ISBN 9788024634708. ^ Hubler, A (1989). "Adaptive control of chaotic systems". Swiss Physical Society. Helvetica Physica Acta 62: 339–342. ^ Wisdom, Jack; Sussman, Gerald Jay (1992-07-03). "Chaotic Evolution of the Solar System". Science. 257 (5066): 56–62. Bibcode:1992Sci...257...56S. doi:10.1126/science.257.5066.56. ISSN 1095-9203. PMID 17800710. ^ Sync: The Emerging Science of Spontaneous Order, Steven Strogatz, Hyperion, New York, 2003, pages 189–190. ^ Hasselblatt, Boris; Anatole Katok (2003). A First Course in Dynamics: With a Panorama of Recent Developments. Cambridge University Press. ISBN 978-0-521-58750-1. ^ Elaydi, Saber N. (1999). Discrete Chaos. Chapman & Hall/CRC. p. 117. ISBN 978-1-58488-002-8. ^ Basener, William F. (2006). Topology and its applications. Wiley. p. 42. ISBN 978-0-471-68755-9. ^ Vellekoop, Michel; Berglund, Raoul (April 1994). "On Intervals, Transitivity = Chaos". The American Mathematical Monthly. 101 (4): 353–5. doi:10.2307/2975629. JSTOR 2975629. ^ Medio, Alfredo; Lines, Marji (2001). Nonlinear Dynamics: A Primer. Cambridge University Press. p. 165. ISBN 978-0-521-55874-7. ^ Ovchinnikov, I.V. (March 2016). "Introduction to Supersymmetric Theory of Stochastics". Entropy. 18 (4): 108. arXiv:1511.03393. Bibcode:2016Entrp..18..108O. doi:10.3390/e18040108. ^ Ovchinnikov, I.V. ; Schwartz, R. N.; Wang, K. L. (2016). "Topological supersymmetry breaking: Definition and stochastic generalization of chaos and the limit of applicability of statistics". Modern Physics Letters B. 30 (8): 1650086. arXiv:1404.4076. Bibcode:2016MPLB...3050086O. doi:10.1142/S021798491650086X. ^ Watts, Robert G. (2007). Global Warming and the Future of the Earth. Morgan & Claypool. p. 17. ^ Li, T.Y. ; Yorke, J.A. (1975). "Period Three Implies Chaos" (PDF). American Mathematical Monthly. 82 (10): 985–92. Bibcode:1975AmMM...82..985L. CiteSeerX 10.1.1.329.5038. doi:10.2307/2318254. JSTOR 2318254. Archived from the original (PDF) on 2009-12-29. ^ Strelioff, Christopher; et., al. (2006). "Medium-Term Prediction of Chaos". Phys. Rev. Lett. 96 (4): 044101. Bibcode:2006PhRvL..96d4101S. doi:10.1103/PhysRevLett.96.044101. PMID 16486826. ^ a b Feigenbaum, Mitchell (July 1978). "Quantitative universality for a class of nonlinear transformations". Journal of Statistical Physics. 19 (1): 25–52. Bibcode:1978JSP....19...25F. CiteSeerX 10.1.1.418.9339. doi:10.1007/BF01020332. ^ Okulov, A Yu; Oraevskiĭ, A N (1986). "Space–temporal behavior of a light pulse propagating in a nonlinear nondispersive medium". J. Opt. Soc. Am. B. 3 (5): 741–746. Bibcode:1986OSAJB...3..741O. doi:10.1364/JOSAB.3.000741. ^ Okulov, A Yu; Oraevskiĭ, A N (1984). "Regular and stochastic self-modulation in a ring laser with nonlinear element". Soviet Journal of Quantum Electronics. 14 (2): 1235–1237. Bibcode:1984QuEle..14.1235O. doi:10.1070/QE1984v014n09ABEH006171. ^ Sprott, J.C. (1997). "Simplest dissipative chaotic flow". Physics Letters A. 228 (4–5): 271–274. Bibcode:1997PhLA..228..271S. doi:10.1016/S0375-9601(97)00088-1. ^ Fu, Z.; Heidel, J. (1997). "Non-chaotic behaviour in three-dimensional quadratic systems". Nonlinearity. 10 (5): 1289–1303. Bibcode:1997Nonli..10.1289F. doi:10.1088/0951-7715/10/5/014. ^ Heidel, J.; Fu, Z. (1999). "Nonchaotic behaviour in three-dimensional quadratic systems II. The conservative case". Nonlinearity. 12 (3): 617–633. Bibcode:1999Nonli..12..617H. doi:10.1088/0951-7715/12/3/012. ^ Rosario, Pedro (2006). Underdetermination of Science: Part I. Lulu.com. ISBN 978-1411693913. ^ Bonet, J.; Martínez-Giménez, F.; Peris, A. (2001). "A Banach space which admits no chaotic operator". Bulletin of the London Mathematical Society. 33 (2): 196–8. doi:10.1112/blms/33.2.196. ^ Adachihara, H; McLaughlin, D W; Moloney, J V; Newell, A C (1988). "Solitary waves as fixed points of infinite‐dimensional maps for an optical bistable ring cavity: Analysis". Journal of Mathematical Physics. 29 (1): 63. Bibcode:1988JMP....29...63A. doi:10.1063/1.528136. ^ Okulov, A Yu; Oraevskiĭ, A N (1988). "Spatiotemporal dynamics of a wave packet in nonlinear medium and discrete maps". Proceedings Lebedev Physics Institute (in Russian) N.G.Basov Ed., Nauka, Moscow,Library of Congress Control Number: 88174540 (www.loc.gov). 187: 202–222. ^ Okulov, A Yu (2000). "Spatial soliton laser: geometry and stability". Optics and Spectroscopy. 89 (1): 145–147. Bibcode:2000OptSp..89..131O. doi:10.1134/BF03356001. ^ Steven Strogatz, Sync: The Emerging Science of Spontaneous Order, Hyperion, 2003. ^ Poincaré, Jules Henri (1890). "Sur le problème des trois corps et les équations de la dynamique. Divergence des séries de M. Lindstedt". Acta Mathematica. 13 (1–2): 1–270. doi:10.1007/BF02392506. ^ Poincaré, J. Henri (2017). The three-body problem and the equations of dynamics : Poincaré's foundational work on dynamical systems theory. Popp, Bruce D. (Translator). Cham, Switzerland: Springer International Publishing. ISBN 9783319528984. OCLC 987302273. ^ Diacu, Florin; Holmes, Philip (1996). Celestial Encounters: The Origins of Chaos and Stability. Princeton University Press. ^ Hadamard, Jacques (1898). "Les surfaces à courbures opposées et leurs lignes géodesiques". Journal de Mathématiques Pures et Appliquées. 4: 27–73. ^ Kolmogorov, Andrey Nikolaevich (1941). "Local structure of turbulence in an incompressible fluid for very large Reynolds numbers". Doklady Akademii Nauk SSSR. 30 (4): 301–5. Bibcode:1941DoSSR..30..301K. Reprinted in: Kolmogorov, A. N. (1991). "The Local Structure of Turbulence in Incompressible Viscous Fluid for Very Large Reynolds Numbers". Proceedings of the Royal Society A. 434 (1890): 9–13. Bibcode:1991RSPSA.434....9K. doi:10.1098/rspa.1991.0075. ^ Kolmogorov, A. N. (1941). "On degeneration of isotropic turbulence in an incompressible viscous liquid". Doklady Akademii Nauk SSSR. 31 (6): 538–540. Reprinted in: Kolmogorov, A. N. (1991). "Dissipation of Energy in the Locally Isotropic Turbulence". Proceedings of the Royal Society A. 434 (1890): 15–17. Bibcode:1991RSPSA.434...15K. doi:10.1098/rspa.1991.0076. ^ Smale, Stephen (January 1960). "Morse inequalities for a dynamical system". Bulletin of the American Mathematical Society. 66: 43–49. Bibcode:1994BAMaS..30..205W. doi:10.1090/S0002-9904-1960-10386-2. ^ Gleick, James (1987). Chaos: Making a New Science. London: Cardinal. p. 17. ISBN 978-0-434-29554-8. ^ Mandelbrot, Benoît (1963). "The variation of certain speculative prices". Journal of Business. 36 (4): 394–419. doi:10.1086/294632. JSTOR 2350970. ^ Berger J.M. ; Mandelbrot B. (1963). "A new model for error clustering in telephone circuits". IBM Journal of Research and Development. 7 (3): 224–236. doi:10.1147/rd.73.0224. ^ Mandelbrot, B. (1977). The Fractal Geometry of Nature. New York: Freeman. p. 248. ^ See also: Mandelbrot, Benoît B.; Hudson, Richard L. (2004). The (Mis)behavior of Markets: A Fractal View of Risk, Ruin, and Reward. New York: Basic Books. p. 201. ^ Mandelbrot, Benoît (5 May 1967). "How Long Is the Coast of Britain? Statistical Self-Similarity and Fractional Dimension". Science. 156 (3775): 636–8. Bibcode:1967Sci...156..636M. doi:10.1126/science.156.3775.636. PMID 17837158. ^ Mandelbrot, B. (1982). The Fractal Geometry of Nature. New York: Macmillan. ISBN 978-0716711865. ^ Buldyrev, S.V. ; Goldberger, A.L. ; Havlin, S.; Peng, C.K. ; Stanley, H.E. (1994). "Fractals in Biology and Medicine: From DNA to the Heartbeat". In Bunde, Armin; Havlin, Shlomo (eds.). Fractals in Science. Springer. pp. 49–89. ISBN 978-3-540-56220-7. ^ "The Wolf Prize in Physics in 1986". ^ Huberman, B.A. (July 1987). "A Model for Dysfunctions in Smooth Pursuit Eye Movement". Annals of the New York Academy of Sciences. 504 Perspectives in Biological Dynamics and Theoretical Medicine (1): 260–273. Bibcode:1987NYASA.504..260H. doi:10.1111/j.1749-6632.1987.tb48737.x. ^ Bak, Per; Tang, Chao; Wiesenfeld, Kurt (27 July 1987). "Self-organized criticality: An explanation of the 1/f noise". Physical Review Letters. 59 (4): 381–4. Bibcode:1987PhRvL..59..381B. doi:10.1103/PhysRevLett.59.381. However, the conclusions of this article have been subject to dispute. "?". Archived from the original on 2007-12-14. . See especially: Laurson, Lasse; Alava, Mikko J.; Zapperi, Stefano (15 September 2005). "Letter: Power spectra of self-organized critical sand piles". Journal of Statistical Mechanics: Theory and Experiment. 0511. L001. ^ Omori, F. (1894). "On the aftershocks of earthquakes". Journal of the College of Science, Imperial University of Tokyo. 7: 111–200. ^ Gleick, James (August 26, 2008). Chaos: Making a New Science. Penguin Books. ISBN 978-0143113454. ^ Motter, A. E.; Campbell, D. K. (2013). "Chaos at fifty". Phys. Today. 66 (5): 27–33. arXiv:1306.5777. Bibcode:2013PhT....66e..27M. doi:10.1063/pt.3.1977. ^ Hubler, A.; Foster, G.; Phelps, K. (2007). "Managing chaos: Thinking out of the box". Complexity. 12 (3): 10. Bibcode:2007Cmplx..12c..10H. doi:10.1002/cplx.20159. ^ Stephen Coombes (February 2009). "The Geometry and Pigmentation of Seashells" (PDF). www.maths.nottingham.ac.uk. University of Nottingham. Retrieved 2013-04-10. ^ Kyrtsou C.; Labys W. (2006). "Evidence for chaotic dependence between US inflation and commodity prices". Journal of Macroeconomics. 28 (1): 256–266. doi:10.1016/j.jmacro.2005.10.019. ^ Kyrtsou C., Labys W.; Labys (2007). "Detecting positive feedback in multivariate time series: the case of metal prices and US inflation". Physica A. 377 (1): 227–229. Bibcode:2007PhyA..377..227K. doi:10.1016/j.physa.2006.11.002. ^ Kyrtsou, C.; Vorlow, C. (2005). "Complex dynamics in macroeconomics: A novel approach". In Diebolt, C.; Kyrtsou, C. (eds.). New Trends in Macroeconomics. Springer Verlag. ^ Hernández-Acosta, M. A.; Trejo-Valdez, M.; Castro-Chacón, J. H.; Miguel, C. R. Torres-San; Martínez-Gutiérrez, H. (2018). "Chaotic signatures of photoconductive Cu 2 ZnSnS 4 nanostructures explored by Lorenz attractors". New Journal of Physics. 20 (2): 023048. Bibcode:2018NJPh...20b3048H. doi:10.1088/1367-2630/aaad41. ISSN 1367-2630. ^ Hristu-Varsakelis, D.; Kyrtsou, C. (2008). "Evidence for nonlinear asymmetric causality in US inflation, metal and stock returns". Discrete Dynamics in Nature and Society. 2008: 1–7. doi:10.1155/2008/138547. 138547. ^ Kyrtsou, C.; M. Terraza (2003). "Is it possible to study chaotic and ARCH behaviour jointly? Application of a noisy Mackey-Glass equation with heteroskedastic errors to the Paris Stock Exchange returns series". Computational Economics. 21 (3): 257–276. doi:10.1023/A:1023939610962. ^ Williams, Bill Williams, Justine (2004). Trading chaos : maximize profits with proven technical techniques (2nd ed.). New York: Wiley. ISBN 9780471463085. ^ Peters, Edgar E. (1994). Fractal market analysis : applying chaos theory to investment and economics (2. print. ed.). New York u.a. : Wiley. ISBN 978-0471585244. ^ Peters, / Edgar E. (1996). Chaos and order in the capital markets : a new view of cycles, prices, and market volatility (2nd ed.). New York: John Wiley & Sons. ISBN 978-0471139386. ^ Hubler, A.; Phelps, K. (2007). "Guiding a self-adjusting system through chaos". Complexity. 13 (2): 62. Bibcode:2007Cmplx..13b..62W. doi:10.1002/cplx.20204. ^ Gerig, A. (2007). "Chaos in a one-dimensional compressible flow". Physical Review E. 75 (4): 045202. arXiv:nlin/0701050. Bibcode:2007PhRvE..75d5202G. doi:10.1103/PhysRevE.75.045202. PMID 17500951. ^ Wotherspoon, T.; Hubler, A. (2009). "Adaptation to the Edge of Chaos in the Self-Adjusting Logistic Map". The Journal of Physical Chemistry A. 113 (1): 19–22. Bibcode:2009JPCA..113...19W. doi:10.1021/jp804420g. PMID 19072712. ^ Dilão, R.; Domingos, T. (2001). "Periodic and Quasi-Periodic Behavior in Resource Dependent Age Structured Population Models". Bulletin of Mathematical Biology. 63 (2): 207–230. doi:10.1006/bulm.2000.0213. PMID 11276524. ^ a b Akhavan, A.; Samsudin, A.; Akhshani, A. (2011-10-01). "A symmetric image encryption scheme based on combination of nonlinear chaotic maps". Journal of the Franklin Institute. 348 (8): 1797–1813. doi:10.1016/j.jfranklin.2011.05.001. ^ Behnia, S.; Akhshani, A.; Mahmodi, H.; Akhavan, A. (2008-01-01). "A novel algorithm for image encryption based on mixture of chaotic maps". Chaos, Solitons & Fractals. 35 (2): 408–419. Bibcode:2008CSF....35..408B. doi:10.1016/j.chaos.2006.05.011. ^ Wang, Xingyuan; Zhao, Jianfeng (2012). "An improved key agreement protocol based on chaos". Commun. Nonlinear Sci. Numer. Simul. 15 (12): 4052–4057. Bibcode:2010CNSNS..15.4052W. doi:10.1016/j.cnsns.2010.02.014. ^ Babaei, Majid (2013). "A novel text and image encryption method based on chaos theory and DNA computing". Natural Computing. An International Journal. 12 (1): 101–107. doi:10.1007/s11047-012-9334-9. ^ Akhavan, A.; Samsudin, A.; Akhshani, A. (2017-10-01). "Cryptanalysis of an image encryption algorithm based on DNA encoding". Optics & Laser Technology. 95: 94–99. Bibcode:2017OptLT..95...94A. doi:10.1016/j.optlastec.2017.04.022. ^ Xu, Ming (2017-06-01). "Cryptanalysis of an Image Encryption Algorithm Based on DNA Sequence Operation and Hyper-chaotic System". 3D Research. 8 (2): 15. Bibcode:2017TDR.....8..126X. doi:10.1007/s13319-017-0126-y. ISSN 2092-6731. ^ Liu, Yuansheng; Tang, Jie; Xie, Tao (2014-08-01). "Cryptanalyzing a RGB image encryption algorithm based on DNA encoding and chaos map". Optics & Laser Technology. 60: 111–115. arXiv:1307.4279. Bibcode:2014OptLT..60..111L. doi:10.1016/j.optlastec.2014.01.015. ^ Nehmzow, Ulrich; Keith Walker (Dec 2005). 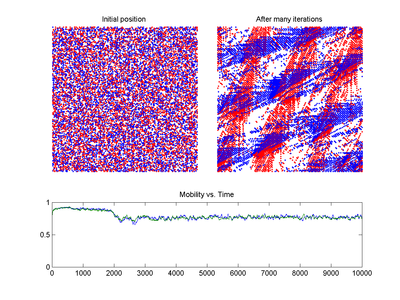 "Quantitative description of robot–environment interaction using chaos theory" (PDF). Robotics and Autonomous Systems. 53 (3–4): 177–193. CiteSeerX 10.1.1.105.9178. doi:10.1016/j.robot.2005.09.009. Archived from the original (PDF) on 2017-08-12. Retrieved 2017-10-25. ^ Goswami, Ambarish; Thuilot, Benoit; Espiau, Bernard (1998). "A Study of the Passive Gait of a Compass-Like Biped Robot: Symmetry and Chaos". The International Journal of Robotics Research. 17 (12): 1282–1301. CiteSeerX 10.1.1.17.4861. doi:10.1177/027836499801701202. ^ Eduardo, Liz; Ruiz-Herrera, Alfonso (2012). "Chaos in discrete structured population models". SIAM Journal on Applied Dynamical Systems. 11 (4): 1200–1214. doi:10.1137/120868980. ^ Lai, Dejian (1996). "Comparison study of AR models on the Canadian lynx data: a close look at BDS statistic". Computational Statistics \& Data Analysis. 22 (4): 409–423. doi:10.1016/0167-9473(95)00056-9. ^ Sivakumar, B (31 January 2000). "Chaos theory in hydrology: important issues and interpretations". Journal of Hydrology. 227 (1–4): 1–20. Bibcode:2000JHyd..227....1S. doi:10.1016/S0022-1694(99)00186-9. ^ Bozóki, Zsolt (February 1997). "Chaos theory and power spectrum analysis in computerized cardiotocography". European Journal of Obstetrics & Gynecology and Reproductive Biology. 71 (2): 163–168. doi:10.1016/s0301-2115(96)02628-0. ^ Li, Mengshan; Xingyuan Huanga; Hesheng Liua; Bingxiang Liub; Yan Wub; Aihua Xiongc; Tianwen Dong (25 October 2013). "Prediction of gas solubility in polymers by back propagation artificial neural network based on self-adaptive particle swarm optimization algorithm and chaos theory". Fluid Phase Equilibria. 356: 11–17. doi:10.1016/j.fluid.2013.07.017. ^ Morbidelli, A. (2001). "Chaotic diffusion in celestial mechanics". Regular & Chaotic Dynamics. 6 (4): 339–353. doi:10.1070/rd2001v006n04abeh000182. ^ Dingqi, Li; Yuanping Chenga; Lei Wanga; Haifeng Wanga; Liang Wanga; Hongxing Zhou (May 2011). "Prediction method for risks of coal and gas outbursts based on spatial chaos theory using gas desorption index of drill cuttings". Mining Science and Technology. 21 (3): 439–443. ^ Glass, L (1997). "Dynamical disease: The impact of nonlinear dynamics and chaos on cardiology and medicine". In Grebogi, C; Yorke, J. A. (eds.). The impact of chaos on science and society. United Nations University Press. ^ Mandell, A. J.; Selz, K. A. (1997). "Is the EEG a strange attractor?". In Grebogi, C; Yorke, J. A. (eds.). The impact of chaos on science and society. United Nations University Press. ^ Dal Forno, Arianna; Merlone, Ugo (2013). "Nonlinear dynamics in work groups with Bion's basic assumptions". Nonlinear Dynamics, Psychology, and Life Sciences. 17 (2): 295–315. ISSN 1090-0578. ^ Redington, D. J.; Reidbord, S. P. (1992). "Chaotic dynamics in autonomic nervous system activity of a patient during a psychotherapy session". Biological Psychiatry. 31 (10): 993–1007. doi:10.1016/0006-3223(92)90093-F. PMID 1511082. ^ Metcalf, B. R.; Allen, J. D. (1995). "In search of chaos in schedule-induced polydipsia". In Abraham, F. D.; Gilgen, A. R. (eds.). Chaos theory in psychology. Greenwood Press. ^ Pryor, Robert G. L.; Norman E. Aniundson; Jim E. H. Bright (June 2008). "Probabilities and Possibilities: The Strategic Counseling Implications of the Chaos Theory of Careers". The Career Development Quarterly. 56 (4): 309–318. doi:10.1002/j.2161-0045.2008.tb00096.x. ^ Thompson, Jamie; Johnstone, James; Banks, Curt (2018). "An examination of initiation rituals in a UK sporting institution and the impact on group development". European Sport Management Quarterly. 18 (5): 544–562. doi:10.1080/16184742.2018.1439984. ^ Dal Forno, Arianna; Merlone, Ugo (2013). "Chaotic Dynamics in Organization Theory". In Bischi, Gian Italo; Chiarella, Carl; Shusko, Irina (eds.). Global Analysis of Dynamic Models in Economics and Finance. Springer-Verlag. pp. 185–204. ISBN 978-3-642-29503-4. ^ Juárez, Fernando (2011). "Applying the theory of chaos and a complex model of health to establish relations among financial indicators". Procedia Computer Science. 3: 982–986. arXiv:1005.5384. Bibcode:2010ProCS...1.1119G. doi:10.1016/j.procs.2010.12.161. ^ Brooks, Chris (1998). "Chaos in foreign exchange markets: a sceptical view". Computational Economics. 11 (3): 265–281. doi:10.1023/A:1008650024944. ISSN 1572-9974. ^ Wang, Jin; Qixin Shi (February 2013). "Short-term traffic speed forecasting hybrid model based on Chaos–Wavelet Analysis-Support Vector Machine theory". Transportation Research Part C: Emerging Technologies. 27: 219–232. doi:10.1016/j.trc.2012.08.004. ^ "Dr. Gregory B. Pasternack – Watershed Hydrology, Geomorphology, and Ecohydraulics :: Chaos in Hydrology". pasternack.ucdavis.edu. Retrieved 2017-06-12. ^ Pasternack, Gregory B. (1999-11-01). "Does the river run wild? Assessing chaos in hydrological systems". Advances in Water Resources. 23 (3): 253–260. Bibcode:1999AdWR...23..253P. doi:10.1016/s0309-1708(99)00008-1. Li, T.Y. ; Yorke, J.A. (1975). "Period Three Implies Chaos" (PDF). American Mathematical Monthly. 82 (10): 985–92. Bibcode:1975AmMM...82..985L. CiteSeerX 10.1.1.329.5038. doi:10.2307/2318254. JSTOR 2318254. Tufillaro; Reilly (1992). An experimental approach to nonlinear dynamics and chaos. American Journal of Physics. 61. Addison-Wesley. p. 958. Bibcode:1993AmJPh..61..958T. doi:10.1119/1.17380. ISBN 978-0-201-55441-0. Abraham, Ralph; et al. (2000). Abraham, Ralph H.; Ueda, Yoshisuke (eds.). The Chaos Avant-Garde: Memoirs of the Early Days of Chaos Theory. World Scientific Series on Nonlinear Science Series A. 39. World Scientific. Bibcode:2000cagm.book.....A. doi:10.1142/4510. ISBN 978-981-238-647-2.